It’s September 27th in Nichol field at Raccoon Creek State Park in southwestern Pennsylvania. The kids are back in school, 99.9% of us have taken our vacations and after Labor Day, the swimming beach at the lake is closed. Danaus Plexxipus has been flying for some weeks now. 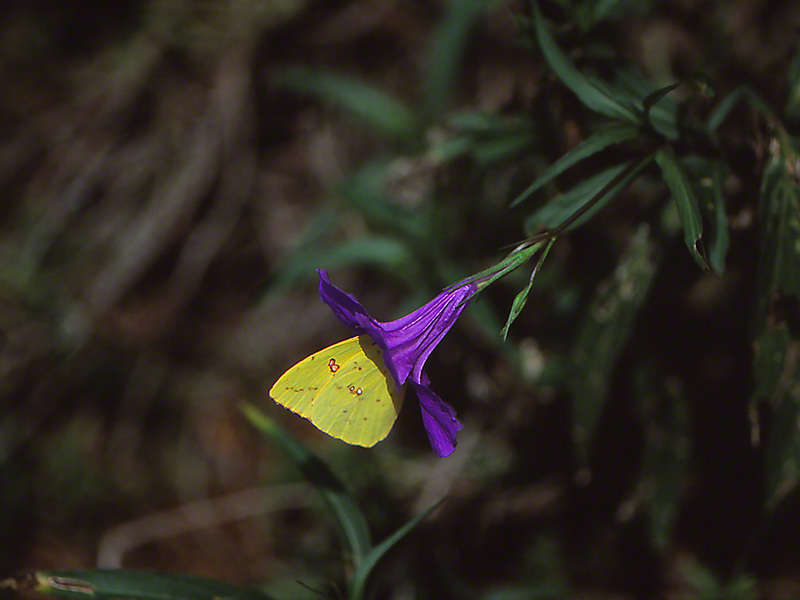 Blessed with its lode of toxic glycosides, its wings remain whole and powerful. Just days ahead it will continue its migration hundreds and hundreds of miles down to Mississippi or Louisiana. Don’t get me started as to how incredible that is! Our monarch butterflies will navigate without roadmap and without GPS. Explain that to me please? I still get razzed because I am GPS challenged. This one may have travelled down from Meadville or points north. Milkweed, dogbane, teasel, and butterflyweed flowers are gone. Huge expanses of Goldenrod await to replace their nectar pumps. 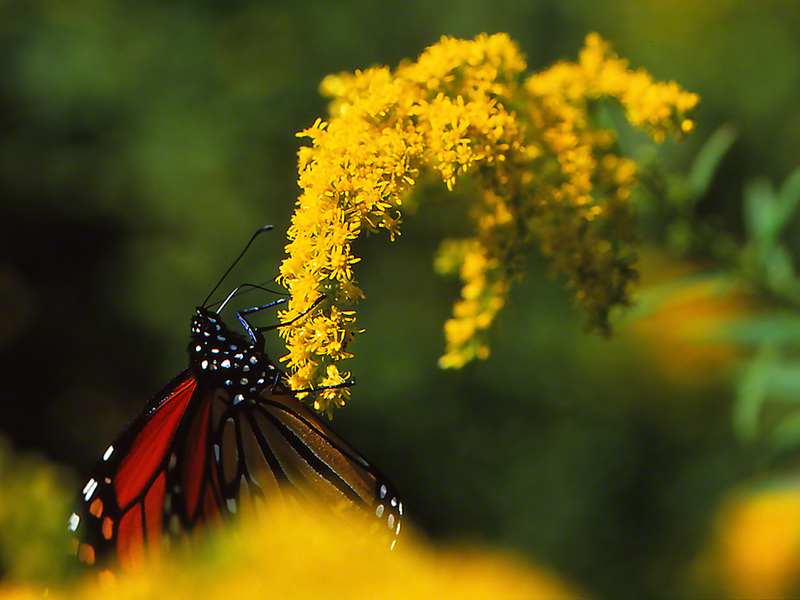 The Plan is to sustain North America’s beloved Monarch travelers with billions of goldenrod flowers, each one producing the nutrients to feed the Monarchs. They are joined by Painted Ladies and other butterflies passing through on their sylvan wings to West Virginia, Kentucky, Tennessee and southward. Goldenrod is not regularly noticed and is little appreciated. 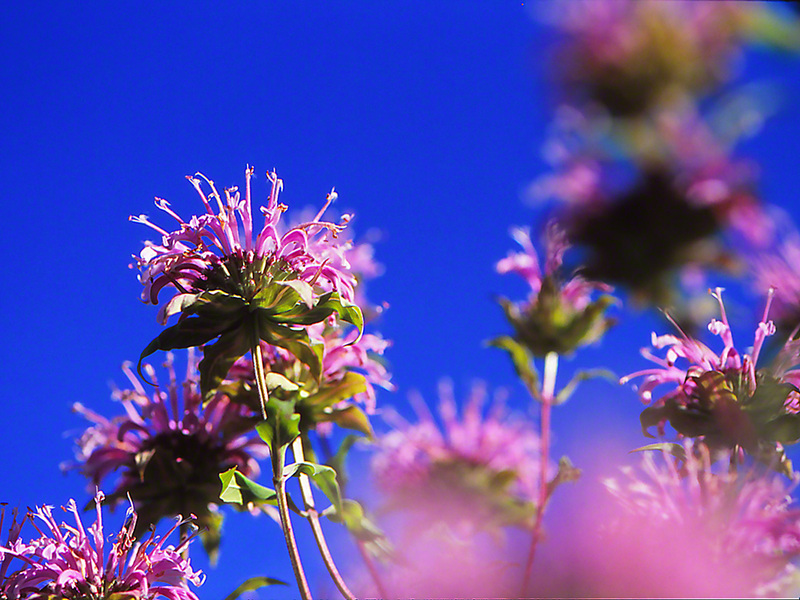 The plant supports America’s Monarchs year after year, and this is a nice tale to tell. This “bug” is one that we have been seeing little of these last weeks, and it’s a sight that grows a little smile at the corners of your mouth. Danaus plexxipus working its way along a Common milkweed leaf, gently eating the leaf in about the same way that some of us work through corn on the cob. 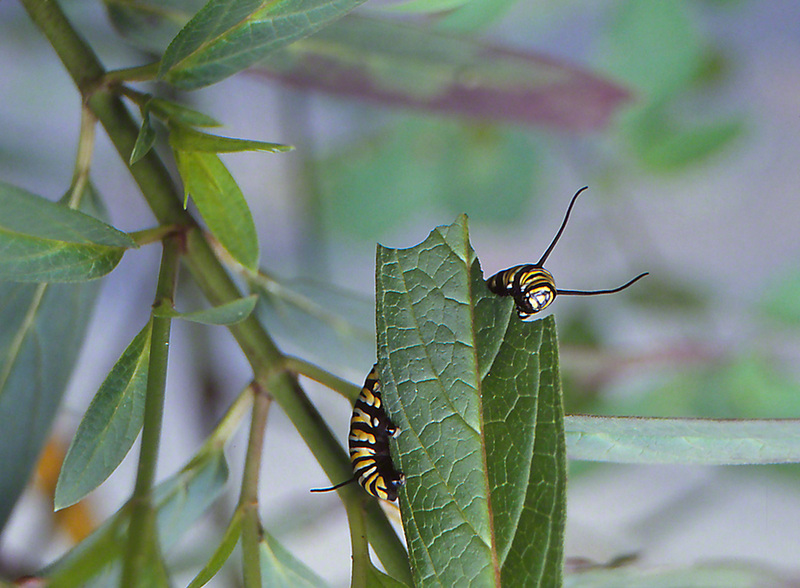 Asclepias Syriaca is gently cut and mashed by the caterpillar’s mouth parts. It is digested, except some of its molecules are not broken down. It’s the glycosides that do not get digested (broken-up). They will be stored in the caterpillar’s body, remaining inert in the pupa and then again in the adult Monarch butterfly. Why is that such a big deal? The glycosides and other related molecules that come from the milkweed leaf are very bitter in taste. 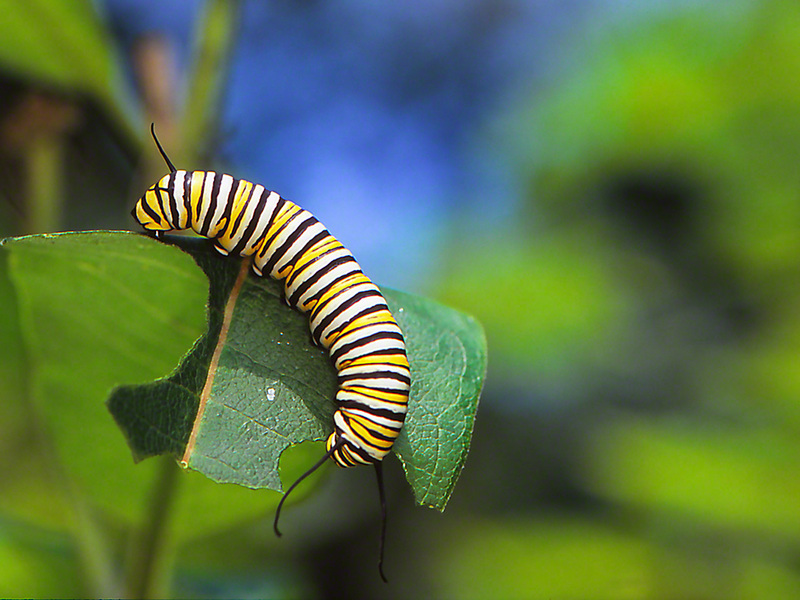 Birds, flies, wasps, lizards, snakes–any animal foolish enough to capture a Monarch caterpillar or butterfly will hold it for approximately 0.001 seconds and then violently spit it out. That, my readers, is classic Protecia. That is why I like to photograph Monarch butterflies. They have beauty, grace, mystery, are native to our land, and their consumption of milkweed almost guarantees that their wings will not show damage. Animals, birds and reptiles know that Monarchs and their caterpillars are like those wiseguys who lived where I did in Brooklyn: You see them. You know they are there, and yet you avoid them as best you can. They are just way too toxic. Funny how frequently I am asked about the toxic aspect of Monarch butterflies. It fascinates many people, almost as much as the migration of Monarchs does. To my knowledge this subject remains in the realm of researchers and has not been persuasively explained to the masses in layman’s language. Tens of millions of Americans have some awareness of its existence, but few understand.